All of our Full Cage Kits Now feature Poison Spyder exclusive Lazer-Fit system to ensure precise fit and easy installation. The Lazer-Fit system involves every aspect of the component, from 3-D CAD design to production on state-of-the-art machinery, to easy, worry-free installation. The entire assembly is Fully engineered in 3-D design software, using an actual 3D model of the specific vehicle to ensure the best fit and use of space. Plate steel components are CNEC laser cut and precision brake-formed. Tubular components are laser-cut, laser-Notched and laser-etched to exact tolerances then CNC bent for a quality-assured, precise fit. The result is a kit of parts that match and fit each other perfectly, with no need for further grinding, Notching, fitting or cussing. Assembly guides are laser-etched right onto the surface of the tube, precisely deNoting where the perfectly Notched end of one tube joins the surface of the other. May joints are actually keyed with laser-cut tabs in the tube ends that precisely engage into slots cut into the adjoining piece, making it nearly impossible to assemble the cage incorrectly. 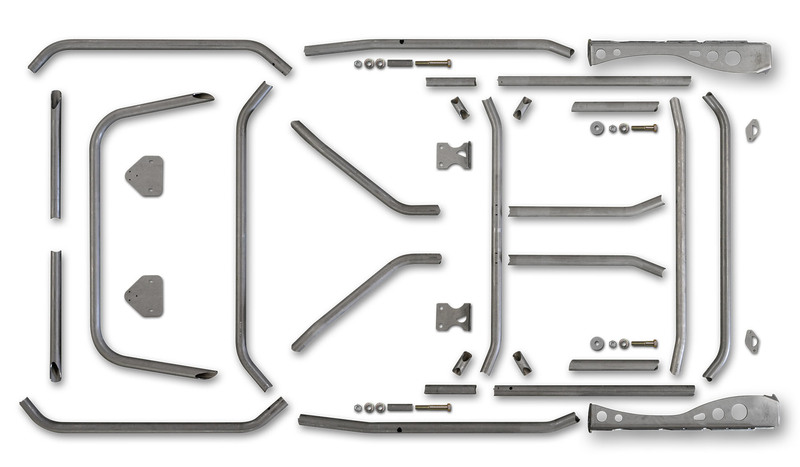 Components are also etched with part identification marks to take all the guesswork out of assembling your cage. Lazer-Fit cuts the assembly time in half (or more! ), compared competitor cage kits. The Lazer-Fit Full Cage Kit incorporate Poison Spyder proprietary Lower A-Pillars. The Lower A-Pillar is engineered to provide a strong foundation for the forward section of the cage while Not intruding into the dash or compromising legroom. The Lower A-Pillars and gussets, as well as all mounting plates, are CNC laser cut and precision brake-formed from high strength 3/16 inch plate steel for quality and fit. The Lazer-Fit Full Cage Kit was recently re-designed to provide approximately 3/4 inch more head room, while still fitting under the factory hard and soft top. The design of the center stringer tubes was re-configured to provide maximum head room further forward. The rear passenger area also received increase headroom, and there is also more room for the hard top rear window wiper motor. The B-Pillar is the Most Important structural member of the cage. The B-Pillar tube in the Poison Spyder Lazer-Fit Full Cage was recently re-designed to both increase its strength and provide more interior room. The B-Pillar Now hugs the inside walls of the Jeep tub and top more closely, providing more room inside the cabin. And we have included weld-in bolt sleeves and 1/2 inch Grade 8 bolts that tie the cage in to the OE roll bar brackets on the inside of the cage tub, providing extra strength to both the cage and the side of the Jeep body tub. At the top, the B-Pillar connection to the cage assembly is strengthened with laser-Notched 90 degree tube gussets. Entry Grab Handles may be added to make entry and exit easier, as well as providing a secure grab handle while wheeling. Made of 1.25 inch X .120 wall tubing, bent and laser Notched to perfectly fit Poison Spyder Lazer-Fit cages. Kit comes with both right and left handles. Installation is easy for the DIY installer, as the installation guide marks have been laser-etched right into the tubes of the cage.